Looking to make a case for your brand? You might be looking in the wrong place. If you think the business of selecting building products rests with architects alone, think again. Clinching specification for building products brands in a Recession-wary world now requires a whole-team approach and a marketing plan that spans the group. Yes, architects still pull some strings, but they’re weighing the options with a growing team of experts. So spec writers, land planners, interior designers and nonregistered professionals all have a say in the products getting specc’d. Powerful technology tools also are tipping the scales. Building information modeling and MasterSpec software are prime examples. Combine those with online communities, social networks and website content, and you’ve got the makings of success. It’s a complex proposition, but Point To Point will help. We have the experience and the creative vision to round out a comprehensive, measurable and responsive plan that engineers demand. 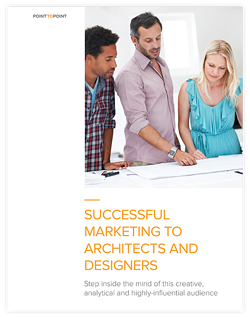 Get the details in our how-to whitepaper, “Successful Marketing to Architects & Designers.” We profile the players, spotlight the go-to resources and brief you on how to tell them the stories that matter most. Download our whitepaper now, at no cost, by filling out the request form at right. And let us show you how to create a plan that transforms growth. Complete the form to get the whitepaper now.